Chanteur Country US né Daryl Mark Williams, le 8 Août 1973 à Cleveland (Tennessee). Although he didn't quite achieve the fame or sales of new country contemporaries as Tim McGraw or Clay Walker, Mark Wills earned a respectable following and strong reviews following the release of his eponymous 1996 debut album. As a teenager in the small town of Blue Ridge, GA, Wills (born Mark Williams) was fond of pop-metal bands like Poison and Bon Jovi, and throughout his teens he played in metal garage bands. But as he became an adult, his tastes shifted toward country-pop and new traditionalist country. Considering that he grew up around country music, singing it both at home and in church as a small boy, this wasn't surprising. At the age of 17, he entered a talent show at the Buckboard Country Music Showcase in nearby Marietta. 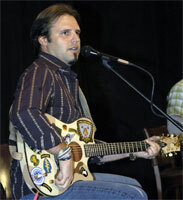 He won the contest, which quickly led to weekly performances at the Buckboard. For five years, he played at the club five nights a week. In addition to his regular shows, he began singing on demo tapes in the Atlanta area, eventually working his way into the Nashville demos circuit. At one of his Buckboard shows, he was spotted by Carson Chamberlain and Keith Stegall, who helped him secure a contract with Mercury Nashville. Chamberlain and Stegall produced Wills' eponymous debut album, which was released in the fall of 1996. The record became a moderate country hit, peaking at number 38 on the country charts. Wish You Were Here followed in 1998, and in early 2000 Wills returned with Permanently.